Note: The results of this summer project have been published in December 2010 – see bottom of page. My project this summer (June to August 2010) at the Field Museum of Natural History (Chicago, IL, USA) is to revise the genera Ectyphus and Parectyphus (Mydidae: Ectyphinae). Both genera are known to southern Africa, although very few specimens have been collected. They prefer arid habitats and may only emerge for a few weeks out of the year, making collection difficult. However, the few specimens deposited in museums represent a number of unidentified and new species. Although Ectyphus has only been observed in the coastal regions of South Africa, new specimens from Kenya were recently collected. The single previously known specimen of Parectyphus namibiensis is now complemented by more Namibian and South African specimens with striking differences in morphology. 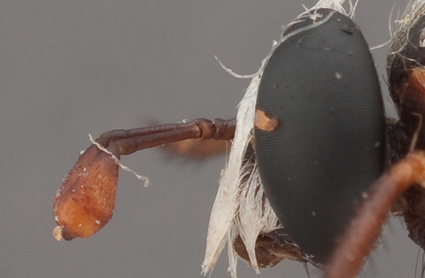 Male syntype of Ectyphus pretoriensis in lateral view (deposited in SAMC). Photographed by Katie Lyons. 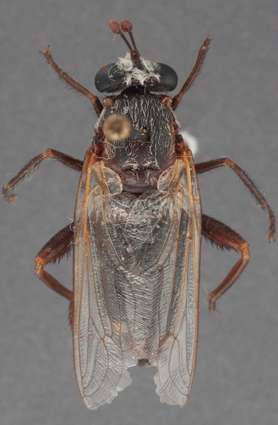 A yet undescribed species of Ectyphus from Kenya in dorsal view (deposited in CAS). Photographed by Katie Lyons. I will photograph the specimens and create a morphological matrix. The software Lucid 3.5 will be used to directly export the matrix as a natural language species description for the new species. An interactive online identification key will be created based on a character matrix using the software Lucid and a dichotomous key with the software Phoenix, complemented by specimen photos. I will also create species pages for the Ectyphus and Parectyphus species on the Encyclopedia of Life website. My morphological data, georeferencing data, and photographs will be used for both this website and a scientific publication describing the new species. Head of holotype of Parectyphus namibiensis in lateral view (deposited in SMNS). Photographed by Katie Lyons. Holotype of Parectyphus namibiensis in dorsal view (deposited in SMNS). Photographed by Katie Lyons. 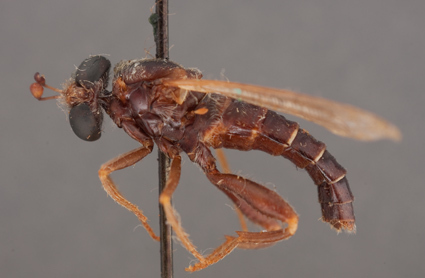 This work is supported with a summer stipend by Torsten Dikow's NSF REVSYS grant on Apioceridae, Asilidae, and Mydidae (details here). The revision of both genera has been published: Lyons, K.M. 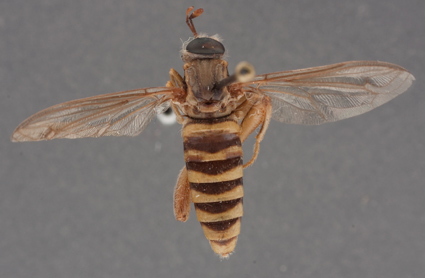 & Dikow, T. 2010 Taxonomic revision of Ectyphus Gerstaecker, 1868 and Parectyphus Hesse, 1972 with a key to world Ectyphinae (Insecta: Diptera: Mydidae). ZooKeys 73: 25–59. For details and download of a free PDF see either the Bibliography or the publication site. You can also use the following link directly to access the paper on the ZooKeys web-site.